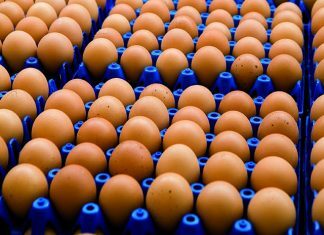 The process of egg production, hatching, processing and delivery of a quality poult are all important and stressful points that impact the lives of young birds; each need to be well managed and monitored. Once poults are placed, they are further challenged by growth, environment, nutrition, management, and disease. All of which are areas that if properly managed, can work to enhance flock performance. Thorough knowledge of environmental controls has become increasingly important in recent years. The control systems for air exchange, temperature, relative humidity, carbon gases as well as water sanitation technologies have helped to realize the genetic benefits in today’s products, leading to increased production and profits. The increased understanding and implementation of these controls have certainly worked to benefit many in the area of animal welfare. The process to prepare poults for farm placement begins in the hatchery. Poults that are incubated at the proper temperature and humidity, while hatched during the appropriate time, or “hatch window”, have a much greater opportunity to perform better than those that are not. Poults that are exposed to overheating with reduced air exchange during the incubation and hatch process are more prone to having larger yolk-sacs and are less prepared for the brooder environment. Poults that are hatched at the correct hatch window and temperatures have a smaller yolk-sacs and are better conditioned to consume feed and water upon placement. 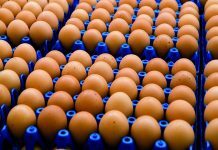 The yolk contains maternal immunoglobulin, which is essential to protect the bird against pathogens during the first few days of life. Residual lipids in the yolk are the essential components of cell membranes. Amino acids and energy should be supplied by the feed. The yolk-sac contents should not be used to supply amino acids and energy as the yolk contents are not adequate to initiate growth. There are three major systems that are not fully developed at the time of hatch: the digestive, immune and thermoregulation systems. At placement, feed and water consumption is the stimulus to begin and support the development of the intestinal tract. It is this development that leads to the efficient use of nutrients to stimulate and develop the immune system. The intestinal tract is the largest lymphoid organ in the body. Development of the intestinal tract impacts the immune system function. Fasting impacts intestinal tract development and releases corticosteroids which delays the immune system development. Intestinal growth begins 24 hours after first ingesting food (when nutrients become available). At this time rapid development of the intestinal tract begins. The absorptive surface area increases by increasing the size of the villi. The mass of the small intestine increases by 600% in the first 7 days of the poults life. The development and management of the thermoregulation system takes place during the first four days after hatch. It is during this time the poult is reliant on their external surroundings to control and maintain body temperature. A proper environment allows for and supports the activity needed for adequate nutritional intake for a quality start. Brooder preparation must start with having adequate down time between flocks. A period of 21 days with 7 days of empty rest between cleaning and the setup of the new flock has been adopted by much of the industry. There is no way to eliminate all exposures to disease but managing and reducing levels of potential pathogens can allow the bird’s own immune system to resist becoming symptomatic from mild contact and exposures. Producing the proper presentation of feed, water with correct spacing of both is essential but often over looked. The same can be true of light intensity, spectrum and duration. The Hybrid Turkeys Resources is a very good reference point to check many of the requirements at resources.hybridturkeys.com.Water sanitation is extremely important for brooder house preparedness to secure a quality start. Why do we need on farm water sanitation? For water systems that are supplied by on farm wells, mineral and pH levels could contribute to high bacteria loads. Many farms are supplied water from public systems that are safe for consumption. However, it is what we do with that good water in the farm water system that creates the problems. “Naturally occurring iron, manganese, and sulfur as well as utilizing products such as probiotics, citric acid, vitamins, organic acid, vaccines and milk replacer can lead to the development of microbial growth known as biofilm”. It is the biofilm that helps to protect bacteria and molds in the water system even in the presence of some water sanitation programs. This is why it is very important to start the flock with clean water lines with a consistent water sanitation treatment program to control undesired growth and exposures. There are times when it is necessary to use products without the use of water treatment, for example, during on farm vaccinations, but those exposures should be kept to a minimum to reduce water line contamination. If in doubt, take water line swabs to a lab to measure both the effectiveness of both your water line cleaning and sanitation programs. This is one area that gets a great deal of discussion but is the least executed. Some water issues need to be resolved with more than just a water sanitizer alone and professional assistance may be needed. The brooding environment must be supportive of the needs of the poult during the time when they are most vulnerable and reliant on their external surroundings. Poult vent temperatures between (103°- 104°F) have shown to give the best outcome for consistent starts. Hybrid’s hatchery experts agree and suggest that the vent temperature range at delivery should not fall below 102.5°F and not to exceed 104.5°F. 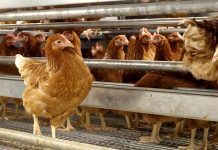 The brooding environment should provide even distribution of the appropriate floor temperatures across the feed and water space allowing for free movement for optimum consumption. Regardless of the brooding heat source, what the day old poult wants and needs should not vary regardless of heat type. The heat source should create floor temperatures ranging between (90°-95°F) at placement allowing the birds to utilize all the feed and water space. Stove temperatures that are set too high, have inconsistent heat cycles or do not properly project their heat can create hot spots that can exceed the poults’ needs. This becomes evident when the floor temperatures across the feed and water area are consistently in excess of 95°F resulting in elevated vent temperatures causing the birds to back away from consuming both. The same is true when the floor is too cold leading to huddling with depressed activity. Both overheating and cooling can result in large numbers of flip-overs if left unchecked. Using a thermometer to check vent temperatures at placement and post placement can help to monitor these issues and serve as a tool to modify conditions. It is important to note that early lay hatch poults require extra care as to temperature, feed and water access. It is made more difficult when flocks are mixed with older poults due to flock size. Proper brooder preheating is another of the underestimated areas of brooder preparation. It is very critical and can vary depending on the time of year as to it duration. It is suggested to allow 24-48 hours depending on the time of year and up to 72 hours during extreme cold. It is easy to create surface heat on the bedding that is shallow, though time is needed to build in heat deep into the bedding material. Cold floors can quickly reduce body temperature and reduce activity that further complicates early activity and consumption. When it comes to ventilating turkey barns during cold weather, 95% of the time, the goal is to manage moisture levels. It is well understood that excess litter moisture can lead to ammonia and bacteria build up that can result in leg issues. For every 1 lb. of feed intake, a bird will drink approximately 2 lbs. of water. Approximately 80% of that water consumed ends up in the litter or in the air. This moisture must be removed from the barn in order to maintain litter and acceptable humidity levels by replacing the warm damp air in the barn with cold dry air from outside the barn, without chilling the birds and wasting fuel. One of the most efficient methods for removing moisture in poultry barns is through negative pressure minimum ventilation. Exhaust fans with inlets are designed to create a negative pressure in the barn while allowing the moisture to be removed by taking advantage of the difference between the inside and outside temperature. Proper minimum ventilation starts with a tight barn with few air leaks resulting in the majority of the air entering the barn through the inlets. When this occurs and the correct static pressure is achieved, the cold air can be mixed with the warm moist air concentrated at the ceiling. This accomplishes two goals. First, the cold air does not drop directly on the floor resulting in birds being chilled. Second, the warm air at the ceiling tempers the incoming cold air, expanding this air and allowing it to increase its water holding capacity. As the incoming air is warmed by 20°F, the water holding capacity of that same air volume is doubled. So when 1,000 ft³ of air holding approximately 6 oz. of water is warmed from 40°F to 60°F, the same 1,000 ft³ of air can hold 12 oz. and 24 oz. at 80°F. When incoming air is preheated, it expands its ability to carry moisture so it can then mix with the air near the floor picking up additional moisture and removing it through the negative pressure fans. Then by measuring the relative humidity (Rh) in the brooder it is possible to use the exhaust fans as a water pump to control the desired level of moisture, which should not exceed 60% Rh. 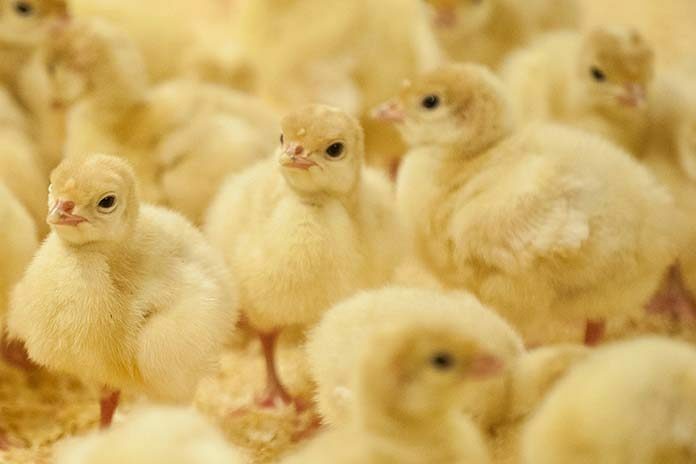 In addition to controlling humidity in turkey barns, Carbon Dioxide (CO2) and Carbon Monoxide (CO) can have profound effects on bird performance, if not regulated and controlled. According to research by Frame. et al., 2010, CO levels above 25 ppm and CO2 levels above 2,500 ppm have been proven to increase round-heart and reduce thyroid activity in young turkeys. Christensen et al. showed that CO2 levels above 4,000 ppm resulted in altered metabolism, depleted glycogen reserves, and lower blood glucose levels. Lower metabolism negatively impacts feed and water consumption resulting in poor gut health and performance over time. Therefore, it is critical to monitor and maintain CO levels to less than 25 ppm and CO2 to less than 2,500 ppm. 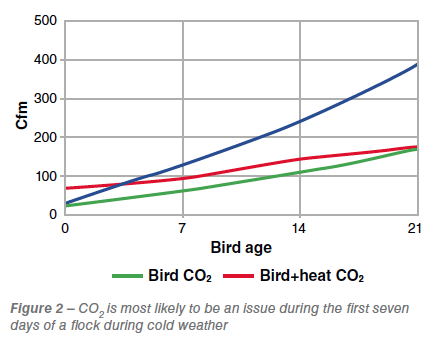 The chart here shown is from a study done by the University of Georgia that looked at the levels CO2 produced by the birds and heaters during the brooder phase. It shows that if the brooder is properly balanced with the correct air exchange and heat to maintain both temperature and CO2 levels, it is not until about day 7 when moisture become a factor. If this balance is not met in the first days it can result in elevated CO2 levels and depressed poult activity. This in turn reduces feed and water intake which is critical for a quality start. After the first week the Rh indicated in the blue line should dictate the air exchange and CO2 should not be an issue. A range of 55-70 Btu’s per sq. ft. is recommended depending on the quality of the building and geographic location. There are a great many processes that go into the preparation and execution of quality poult starts. Having been on both sides of producing and receiving poults, it is clear that there are precise requirements that must be met to be consistently successful. The process is a chain of events that starts as far back as breeder parent stock preparation, to actual on farm poult placement. All the processes or links must follow one another in correct order and at a high level of precision and consistency. Good and timely feedback is a key component at all levels of the chain as the true strength of any chain is measured by its weakest link.